The reign of Edward I at the end of the thirteenth century was a time when the kingdom of England was becoming more prosperous and populous. It was a time, too, that saw the creation of a group of new towns guided by the king’s hand. This is an atlas showing what these towns may have looked like then. It is intended to be used by anyone interested in urban life in the middle ages, whether students, academics, tourists, local communities, or government agencies. For each town you will find maps and images, as well as historical interpretation, bibliographical information, and access through to a geographical database. Thirteen towns are included. In north Wales, one group was created largely for military purposes as part of Edward I’s efforts to bring the Welsh closer under his political control, while a second group, in England, were created more for trading purposes, to foster commerce and profit in the economic heart of his expanding realm. The atlas maps out these ‘new towns’, showing not only their location and date of foundation, but also their physical make-up, their urban form. As well as the more obvious architectural survivals of the towns’ medieval churches, castles, gates and defences, other elements of their urban landscapes also survive through to the present-day, including original street-patterns and arrangements of building plots. Through the maps contained in this atlas some appreciation should be gained of the towns’ initial size and layout, their early features and attributes, together with an understanding of their individual origins and purpose. 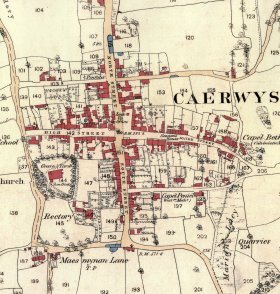 More generally, the atlas sheds new light on those places described by historians as ‘new towns of the middle ages’, places whereby a town was established on a previously un-urbanised site. As such, the individual towns covered by this atlas provide case studies of medieval town planning, and a basis for further comparative research on Europe’s medieval urban heritage. The structure of the atlas is as follows. There are two further introductory sections: one is about the towns included in the atlas and the reasons they were chosen; after this a second section explains how the atlas maps were made and how they can be used. The main substance of the atlas then follows this, with a short introduction. This main section has interpretative text and maps for each of the individual towns the atlas covers. 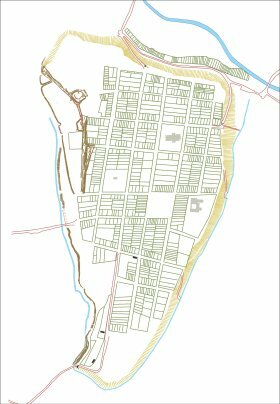 If you are mainly interested in a particular town you may wish to skip through to this section of the atlas, though to properly understand the maps presented there you may need to refer back to the earlier sections. An appendix includes material on towns not covered in detail by the atlas but which nevertheless belong to the same group of ‘Edwardian’ towns that form the focus of the atlas as a whole. Finally, there is a summary of the atlas. Should you wish to find out more about the sources used, or if you wish to conduct follow-up work, there is also a bibliographic resource. Read more about the towns and the maps.